Enhance your property value and your design statement at the same time by relying on us to perform your full-service kitchen remodel. Our company is staffed with a whole team of designers, contractors, and other trade professionals who can create the kitchen you’ve always wanted. We work with every aspect of the process, from plumbing fixtures to lighting, flooring, countertops, and more. Each part is tailored to your preferences. You get to pick the colors, styles, patterns, and more while we do the work to bring your vision to reality. Custom kitchens often bring more benefits than their owners can imagine. Besides the boost in appearance and home value, you also have the advantage of a kitchen that is specially made for your needs and lifestyle. If you’re a master chef who could use an extra-long countertop, this is your chance. All of the china you want to display but also keep safe can now go inside a special cabinet. If you’re pressed for space, we can even help you combine functions and make your kitchen a social area too. The possibilities are endless. Your kitchen is the heart of your home, so we believe it should reflect who you are. Our remodeling team makes putting your personal stamp on the project easy with a custom kitchen design. We work with you to draw up a plan for how the finished product is going to look, one that incorporates not just your needs but your personality too. Why settle for the same neutrals everybody else has when you could have your favorite colors in bright hues? Imagine making your cabinets match your floors, or your countertops tie in with your walls. You’re free to coordinate with the rest of the house or try something new. This is a rare chance to have everything you want—the easy way. You don’t have to have a completely new kitchen to enjoy a higher property value and better look. Another option is to update with a kitchen renovation. This can be as simple or detailed as you like. 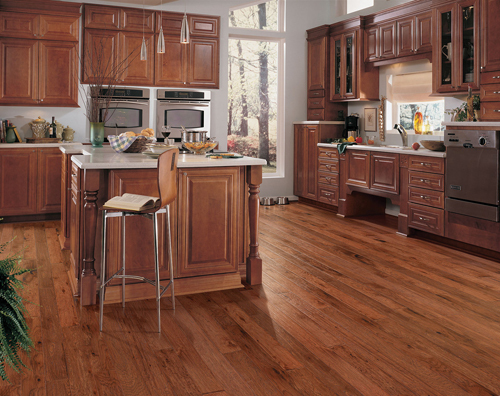 Just a change in flooring or lighting can make an enormous difference in how well your kitchen shows its age. Ask our designers for suggestions and recommendations; we’ll gladly take you on a tour of our showroom and tell you what the possibilities are. No one likes having to climb ladders just to reach what they need or not having enough space to put everything. With custom kitchen cabinetry, you’re rid of those problems forever. As the name suggests, this project has us building cabinets exactly how you want them. Do you need them to have shelves? We can do that. Want them to have a specific type of handle or knob and be a certain color? We can do that too. Best of all, you’ll never have to strain or inconvenience yourself to reach what you need, because they’re placed around your height. Once they’ve been constructed, we’re happy to install your cabinets. We put them exactly where you want, and ensure they’re installed to last a long time. Our team takes careful and accurate measurements so that whatever we build fits perfectly in your space. Your dream kitchen is closer than you think. Contact us to start the remodel process anywhere in Bedford, Hooksett, Hollis, Concord, and Manchester, New Hampshire, and the neighboring communities.